Seattle Hadassah, in conjunction with the Hadassah Pacific Northwest Region, is excited to announce the formation of a Zionist Book Club. 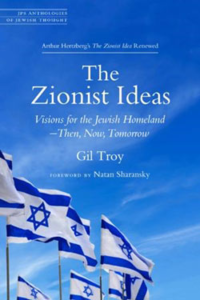 For our first book we have selected The Zionist Ideas: Visions for the Jewish Homeland – Then, Now, Tomorrow by McGill University Professor Gil Troy. Professor Troy’s book examines Zionism through six lenses, each corresponding to a school of Zionist thought: Political, Revisionist, Labor, Religious, Cultural and Diaspora. Book club members will have the opportunity to discuss and reflect on what Israel and Zionism mean in the context of their daily lives. Troy, who served as the scholar in residence for Hadassah’s Milestone Mission to Israel last year, has generously offered his book to Hadassah as a fundraising opportunity. For a $30 donation to Hadassah, members will receive a copy of this text along with a face plate signed by the author. Click here to make your donation and receive your signed copy of The Zionist Ideas. Join us for an opportunity to learn more about Zionism, how to talk about Zionism and how to be an effective advocate on behalf of the State of Israel. This event will be facilitated by Regional Advocacy Chair Kindra Cooper. Meetings will be held in Seward park and the address will be sent to those that RSVP. Members outside of the Seattle area will be able to participate by Zoom. Zoom is an free online video conferencing service. Discussions for this book will be March 6, April 3, May 1, May 15 and May 29th, June 12. Please sign and join us at our next meeting. There is no need to register for each book club meeting, just the first one you will be attending.